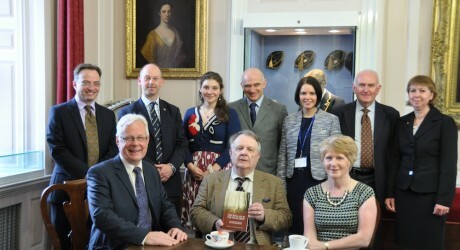 ON Wednesday 30th April, Robert Gordon’s College celebrated the launch of The Ballad and The Folklorist, a book containing the lifetime’s work of one of its former pupils, Professor David Buchan, published after encouragement by another, Dr Ian Olson, his school contemporary. The publication carries the collected papers of David Buchan, Professor of Scottish Ethnology at Aberdeen University in 1994, offering its readers a life time of insight into the ballad and folk narrative of the North-East of Scotland and additional aspects of the local culture. On behalf of its publisher, the Folklore Department of Memorial University of Newfoundland, Dr Olson presented a copy of David Buchan’s book yesterday morning to the college library. As well as ballads and folk narrative, the joyous pages contain other aspects of traditional culture including legends, jokes, folk drama, rhyme, riddle, anecdote, custom and medicine. A founder of the Medical Schools of the University of Nottingham in 1969 and the University of Kuwait in 1974, Dr Olson represents a long line of innovative doctors from Robert Gordon’s College. In addition, he is an established expert in Scottish traditional culture, especially music and song. Hugh Ouston, head of college, said: “David Buchan’s research and understanding of the traditions of North-East Scotland was unrivalled and the new collection is a welcome addition to the library at his old school. We are delighted to see Gordonians involved in preserving the distinctive traditions of the North-East of Scotland. Check out twitter.com/nonstopstories. Check out too the brand new twitter.com/allEducationPR.